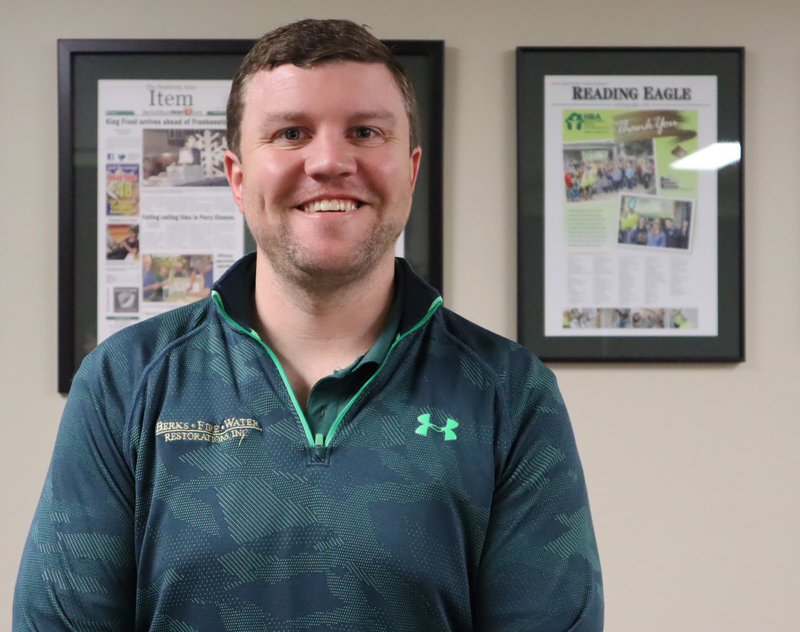 Patrick Detweiler, Construction Manager at Berks • Fire • Water Restorations, Inc.
One of the most memorable jobs he’s ever had to work on recently happened this past May. Berks • Fire • Water Restorations, Inc. was called to a large loss that occurred at a retirement community located in Cumru Township. A fire resulted in the sprinkler system going off in 40 units that were all over 2,000 square feet. Despite this large loss, Patrick and his crew at BFW were able to get the job done and things back to normal within just three weeks. Prior to working here Patrick was a plumber. His wife,Teresa, actually found the job listing on Facebook.“I took some online courses and had been wanting to move in this direction to a management position, so it was perfect,” he explains. Patrick enjoys his job because he enjoys “helping people to rebuild and to grow.” He explains, “I find it rewarding and it makes me feel good.” Patrick also loves the people he gets to call his co-workers. When asked what his best memory is he immediately mentioned how much he enjoyed his first Open House. “Seeing all the customers, the guys in the field and everyone in the office interact and hang out was great,” Patrick says. Another added bonus? Patrick and his wife wouldn’t have their dog, Bentley, if it wasn’t for BFW. Two and a half years ago, Restoration Manager, Trish Ream, and former Communications Director, Jessica Prutzman, brought rescue dogs from the Animal Rescue League of Berks County to BFW. 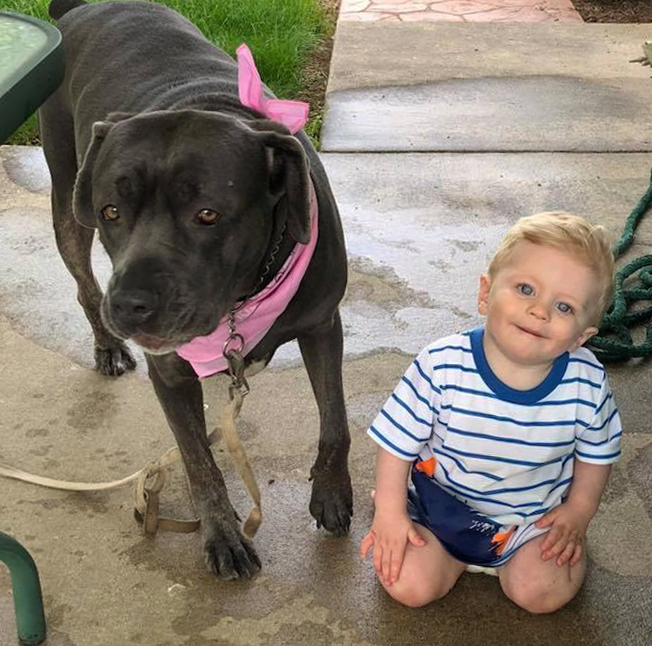 Patrick and his wife offered to foster Bentley, a Cane Corso Italian Mastiff. 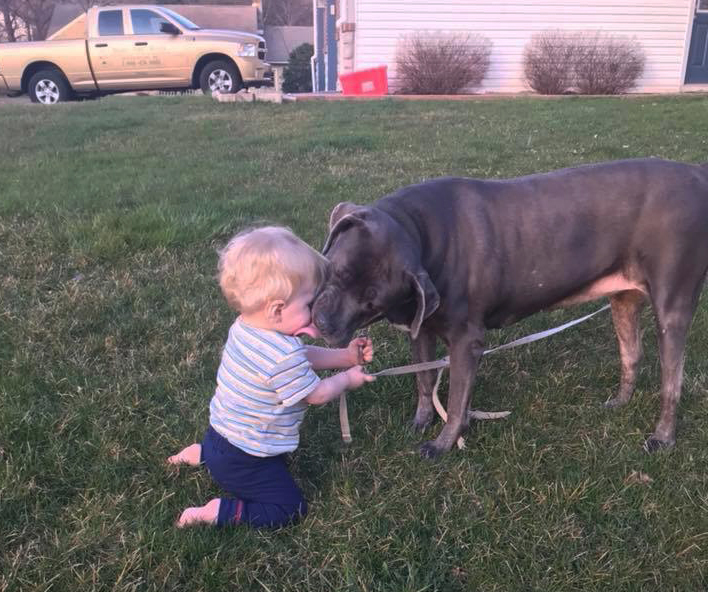 “She was the sweetest, nicest dog,” he recalls. And the rest is history. In two days, Bentley won their hearts over and they adopted her. Their son, who is now 15 months old, seems to have been adopted by Bentley, who loves hanging out with PJ. In his spare time Patrick coaches wrestling at Ephrata for kids between the ages offour and 12. When he first started coaching there were only approximately 25 kids enrolled in the program. Today, just five years later, there are 87 kids involved. Patrickbegan wrestling at age four. According to him,“it was the only sport that you could sign up for so young and was a great way to let out all of his energy.” He continued to wrestle through high school and for one year at Kutztown University. Naturally, his son PJ will follow in his footsteps. He already joins Patrick at practices. “The kids love him,” Patrick says with a smile.